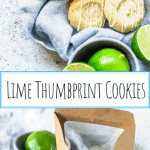 Lime Thumbprint Cookies have got to be some of my favorite cookies I’ve baked this year! I made them twice in the past couple weeks, because I wanted to get a couple things right. The first recipe I made, the cookies were fine. They were delicious. I just thought they spread out too much when baked. The cookies weren’t holding a sturdier shape. I had used a basic cookie sugar recipe, that called for eggs in the dough. So I figured I’d change my recipe. This time, I’d leave the eggs out. Finally, I arrived to my desired results. Cookies that are fluffy, soft, but can hold a nice shape, with a sweet bump, instead of spreading out. Let me give you a couple of tips for making beautiful cookies. I’ve probably already said these tips in some other posts, so I apologize for getting repetitive. However, repetition is the mother of perfection. So, listen up if you want to make PERFECT cookies! Don’t overmix your dough once you add the flour. When flour gets hydrated, it starts to develop gluten, which are proteins that provide elasticity to the baked goods. The more you mix the dough, or batter, after the flour has been added, the more gluten you develop. Therefore, for some types of baked goods, such as cakes, biscuits, cookies, you don’t want to overmix the flour with the other ingredients. Because you are looking for a softer, more crumbly structure. Always bake your cookies out of the freezer! Trust me on this one! For cookies that have a butter base, like this one, it’s best to freeze your cookies until solid before baking. That’s because, if the cookies are soft, the minute you insert them in the oven, the butter will start to melt, and your cookie won’t be able to hold a nice shape. Whereas, if you bake your cookies out of the freezer, the butter in the dough will be solid, giving time for the cookie structure to form before the butter starts to melt. Now those tips are valid for most cookies, specially butter based ones! 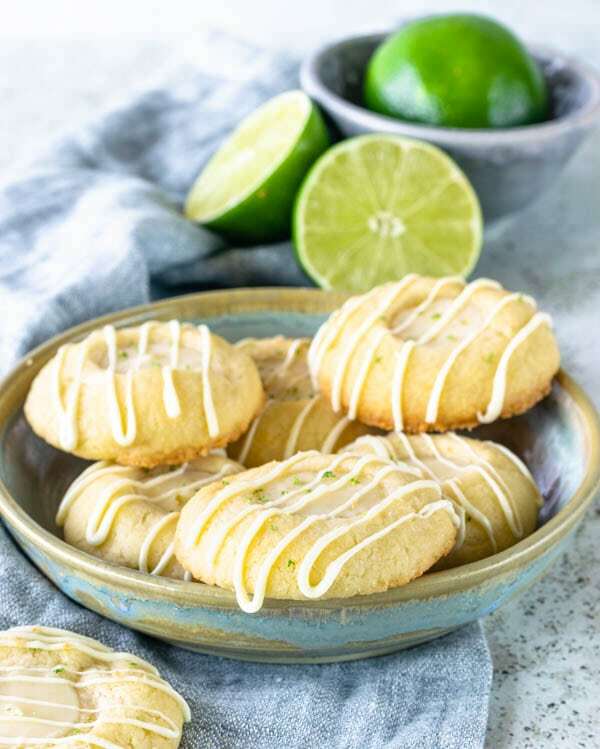 Another special tip I have specifically for these Lime Thumbprint Cookies and any other Thumbprint cookie, is to use a 1/2 teaspoon to make the indentation on top of the cookie. You can use your thumb if you want to, but the teaspoon will really help to form a beautiful round shape! You might want to coat the back of the teaspoon in flour before making the indentation, as it might be sticky with some cookie dough. Then, you can use your thumbs to slightly press down any little dough pieces that might have lifted up. 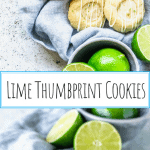 These Lime Thumbprint Cookies felt right from the beginning. I had some lime pie filling leftover after I had made some mini Lime Tarts for a friend, so I figured I’d use my pie filling to make some other goodies. When you make this recipe, you might have a bit of leftover of the Lime Filling. I’d recommend that you either leave it in the refrigerator for up to 4 days, and make more Lime Thumbprint Cookies. Or, you can use the filling to make Lime Tarts, simply fill the pre-baked tart shells with the filling, bake them for 5-8 minutes, and voila! 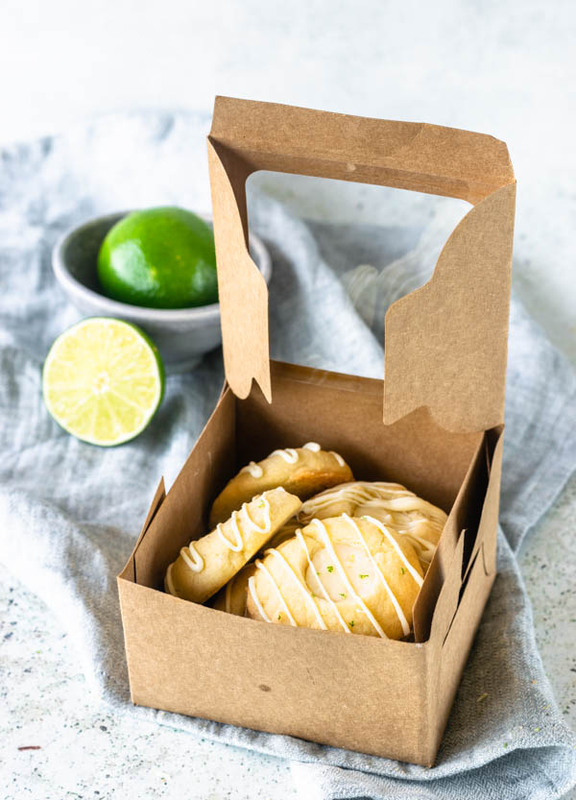 Alternatively, you can store leftover Lime Filling in the freezer for up to 3 months, very well packaged. 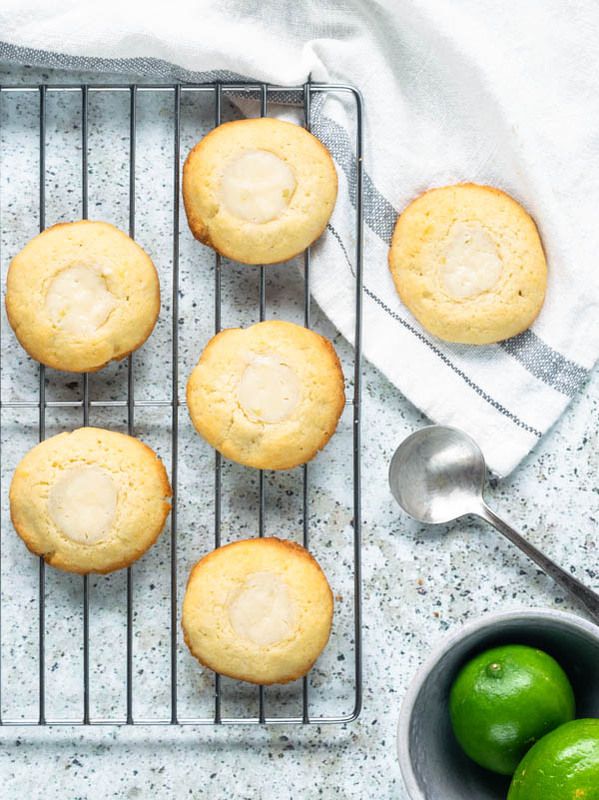 And then, you can make delicious Lime Thumbprint Cookies whenever. The dough is pretty freezer friendly too. So, if you don’t feel like baking all of the cookies, just package the dough really well and leave it in the freezer for up to 2 months. These cookies will surprise and enchant everyone that tries them! Put them in a box and go gift them to a friend (not without sneaking a couple for yourself first!). And, if you’re into making cookie boxes for people, you can think about my Homemade Oreos, Dulce de Leche filled Snickerdoodles, or these delicious Orange Cranberry Madeleines! You know what? Just make them all and send a box over to me! 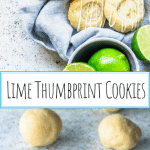 These Lime Thumbprint Cookies are delicious, soft, and chewy! Put them in a beautiful box and gift them to a friend, or serve them for tea time! Cream butter in the bowl of a stand mixer, at medium speed for about 1 minute. Add sugar and keep creaming for another minute or two, until mixture is very fluffy and lightened in color. Add vanilla. Mix for 30 seconds on low. Add flour, salt, and lime zest. Mix for 30 seconds on low. Finish mixing with a spatula if not all flour has been incorporated yet. Remember you don’t want to overmix your cookie dough once you add the flour in. Mix it until ingredients are just incorporated. Shape dough like a disk. Transfer to a zip loc bag, or wrap it in plastic wrap. Refrigerate dough for 30 min-1 hour. You want the dough to have chilled a little bit, but not completely. If you do let the dough chill completely for a few hours or overnight, then take it out of the fridge at least 1 hour before you want to shape your cookies. After resting the dough for 30-60 min, remove it from the refrigerator. You want the dough to be still soft, and just slightly chilled. If dough is hardened, then let it sit on top of the counter for a few minutes before proceeding. Grab your cookie scoop, tablespoon sized. Scoop balls and roll them between your hands to smooth them out. That’s why the dough needs to be soft, because if it’s too hard, you won’t be able to form perfect balls. Place balls on baking sheets, about 3 inches apart. 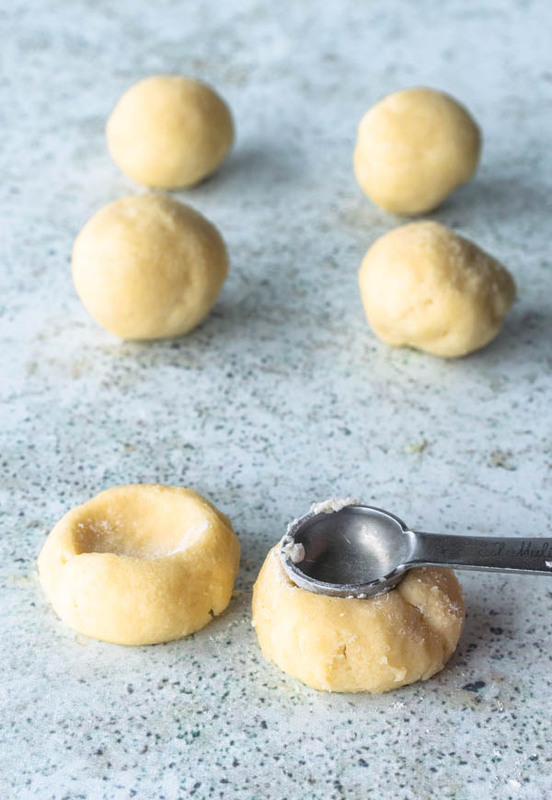 Now, use the back of a 1/2 teaspoon to create an indentation on top of each cookie dough ball. You might have to coat the back of the 1/2 teaspoon in flour before pressing it down on top of the cookie dough, because it might start sticking. If you want, you can use your thumbs, by all means, the cookie is called THUMBprint anyway. However, I like how the 1/2 teaspoon does such a good job at creating a perfectly round indentation. Scoop some of the lime filling on top of cookies. Stick baking sheets in the freezer for 15 minutes each before baking. Pre-heat the oven to 350F while cookies chill. Bake cold cookies for 10-12 minutes, when they start to get brown around the edges and slightly golden all over. Remove from the oven. Let it cool. Melt white chocolate and let it cool for 5 minutes if they are too hot. Place white chocolate in a small piping bag. Cut a small hole on the end of the bag. Drizzle over chocolate and let it set. Store cookies in an air tight container, in the refrigerator, for up to 3 days. You can leave it at room temperature if it’s going to be enjoyed within a few hours. They are really delicious when they are very fresh and soft. To make the lime filling, simply mix all ingredients together. Keep filling covered in the refrigerator for up to 4 days. Keep it in the freezer for up to 3 months. You will probably have more filling than what you need for these cookies. You may freeze the leftovers, or bake it in tart shells, or make more cookies, of course! You will fall in love with these cookies! 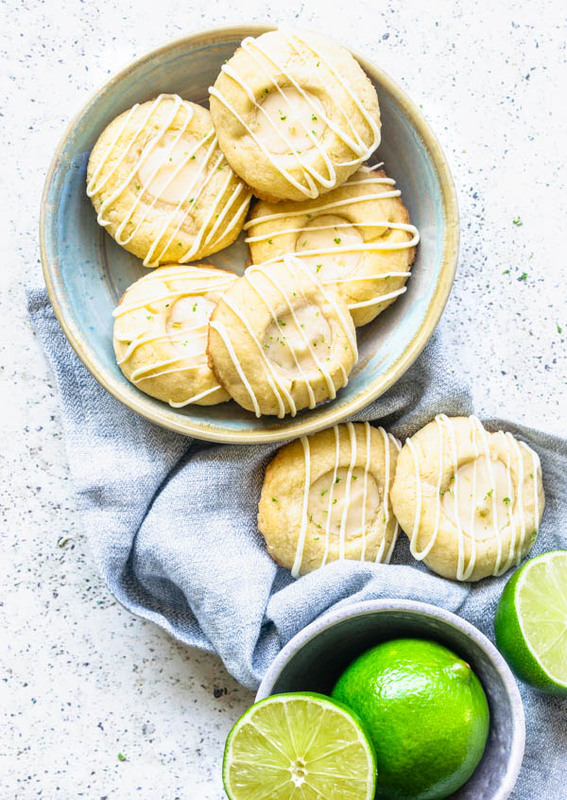 Not only can you freeze the Lime Filling, you can also freeze the cookie dough in case you don’t want to bake all the cookies at once. Dough will keep well in the freezer for up to 2 months, as long as it’s nicely packaged. To use out of the freezer, simply let it thaw on the fridge overnight, or on top of the counter for a couple hours. These are an amazing idea! 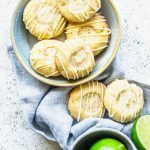 I make a lot of key lime pies and never thought about cookies!! Perfect for just a bite! Thanks for the recipe!! They sound delicious, I reckon I could sit down with a spoon and just eat up all that filling, it sounds glorious! These cookies sound so zesty and delicious. 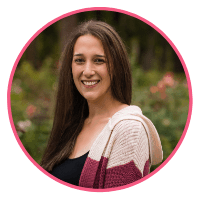 Thanks for all the great tips, too! These cookies are so cute and sound very delicious. They would make the perfect gift for Father’s Day! I am loving the look of these! I think this is a bake my children would absolutely love too – I’ll have to whip them up a batch! These sound delicious! That lime filling sounds incredible – I might just eat the leftovers with a spoon. these cookies will be so refreshing and perfect for this summer time! I can hog on them all day long..
Have you ever tried these cookies using Gluten Free flour? If so, what kind of gluten free flour did you use? I’ve never tried making them with gluten free flour. I have made other treats with gluten free flour, though. I would simply use King Arthur Gluten free multi purpose flour, and add 1 or 2 teaspoons of xanthan gum to the cookie dough! Thank you!